Every time there is a mass shooting you can count on a series of events. First the Media will report on it endlessly. I certainly don’t mean to imply such a horrific event isn’t newsworthy, but the news cycle of the 24/7 cable news means that every 45 minutes they repeat everything they’ve been saying for the last 45 minutes. The result is a constant drum beat that as Mark pointed out (See The media and mass shootings) tends to excite further violence. Second, and quite positively, as people become aware of the danger of their situation they start looking for answers. The Dallas area NBC affiliate reported in an article titled Praying for Protection While Packing a Weapon: Thousands to Attend Security Conference in Plano. That Prestonwood Baptist church in Plano Texas will be hosting a security conference. Thousands of miles away the Maryland Sheriff’s department, about 60 miles north of Washington was teaching the same principle Mark covered in Your role if a shooter or bomber gets in. Namely, use the hymnal or Bible in your hand and hurl it at the assailant. (See: ‘Smack them with a hymnal’ ). 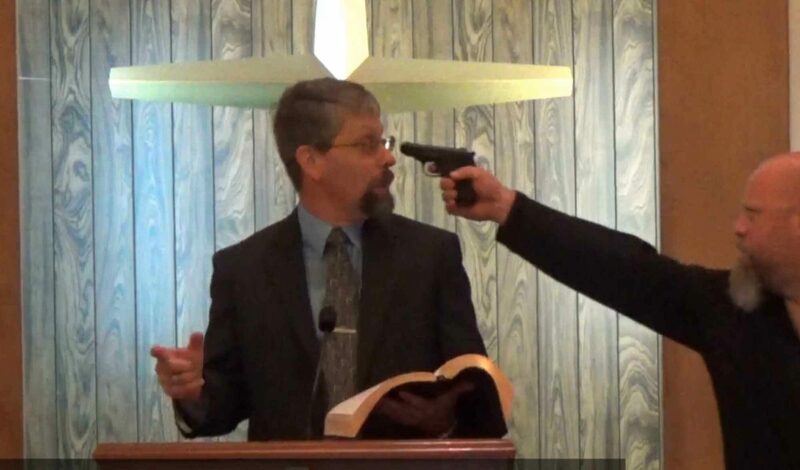 I think this illustrates that there are two responses we can have to the prospect of a mass shooting in our church. The first, like the media which constantly seeks sensationalism, is to incite fear. Fear is not a godly response, neither is it a necessary response. Instead of being afraid, seek to be prepared. Preparation is the second, and I think far wiser response. Take the time to assess what you would do today in the event of a mad man coming into your church. What would you do? What would your pastor do? What can you do? Make a plan, get some training: and be prepared. Need some guidance? Contact us. I feel led to share the Bible verse from the book of James “If any of you lacks wisdom, you should ask God, who gives generously to all without finding fault, and it will be given to you.” (James 1:5 NIV). God can use many different ways to impart wisdom to us. Sometimes it comes from that small still voice, sometimes it comes from a person we meet, and sometimes it comes from the internet (as well as other ways). I am living proof that God will impart wisdom. When I started my quest to help save lives in church, I only knew the basic principles, and I was a novice. Now, six or so years later (and thousands of hours of research later), I have been provided amazing insights into preventing active shooters and bombers in church. It has become my ministry. I have been sharing my insights with you on how to keep your flock safe. Up until this point, I have heard little feedback from you, the reader of this blog. As part of my ministry, I am more than someone that writes a blog; I am a resource for you. Whether you are a pastor, a church member, or someone that just occasionally attends a church (or even none of the above, God put me in this ministry to help you to be safe in these perilous times. The point I am trying to make is I am a resource for you, and your church. Don’t sit in the darkness wondering the answer to a question about keeping your church safe. I am quite approachable, and more than willing to share important information. In the near future, we will be adding a comments section, once our resident geek, Thomas Black, adds some more security measures. When it comes live, please feel free to comment. Beyond that, we are always available for an email at info@savinglivesandsouls.org. You can also contact us through our Facebook page, or even ask us question that others can see. Make sure to like the page while you are there. I should also mention that I am not the only one involved in this ministry. God has sent others to be involved with this ministry as well. Each brings a different strength that supports our work and our mission. Pastor Thomas Black is our resident geek who has designed, built, and maintains our electronic presence. Tim Barton is great at providing feedback from the common person’s perspective and as the President of the Saving Lives and Souls Foundation, he maintains the business perspective (plus he makes an excellent looking bad guy in the video’s). Joe Davies has been involved with the artistic side as well as the public safety side for years. His experience in acting helped with the direction of the video, and he is actually to voice overs for the video right now. I also want to acknowledge the church family and friends that came a long way to help shoot this video. All of the actors you see in any of the videos are volunteers. They believe in the ministry, and they donate their time as needed. We are all here to help keep you (and your church family) safe.